I was lucky enough to visit Iceland this autumn, and even luckier to experience something I’d always wanted to – the northern lights. This is a collage of four images that sum up the experience for me. The aurora had already started appearing over the city as we travelled down to catch the boat – groups of people were gathering and pointing at the sky, others were running through the streets with cameras and tripods. The excitement was really building and finally we were on a small boat, literally feeling buoyant as it zipped us across Reykjavik harbour – out into the night to find the lights. Then they appeared – a pale green arc formed over the boat in the shape of a rainbow, the engines stopped and we floated around silently watching as the arc of light expanded right overhead. It’s hard to describe – but the top edge of the band of light started to move, swirling like sand does when a strong wind propels it across a beach. I noticed a feeling of childlike amazement as well as a connectedness with the people on the boat as we stared skyward. The link to mindfulness for me, was something about the process we went through to see the aurora – planning, preparation, travelling, searching – all ‘doing’ or ‘striving’ activities, and the contrasting sense of just ‘being with’ an incredible experience. I was keen to photograph the lights.. and I was just as keen to really experience them – to look through the lens and receive the images, rather than setting out to ‘capture’ or ‘take’ or strive for anything. I feel grateful that rather than ending up with hundreds of pictures and little memory of what it actually felt like to see the northern lights – I can really remember the experience, the emotions, thoughts and physical sensations I had as I savoured just being there. On a recent trip to Skye I was spoilt for choice – there seemed to be so much to photograph. Mountains with snow on the tops, sweeping down to the sea.. waterfalls collecting in deep, clear pools.. the next island hazily peeping through the sea mist – but one of my favourite images was this one, which I found by looking down. The volcanic rock there lives happily alongside the pale sand and they swirl together to make a distinctive silvery-grey beach. I love the patterns in the sand and the shadows on the seaweed, side-lit by the setting sun. Mindful photography is about appreciating what’s around us and often that’s something right under our noses – like the light glinting off broken glass in an alleyway – or a glossy, thickly-painted red post-box. It reminds me to stop, look, notice – and treasure the moment. A rare appearance of the sun tempted me out on a mindful stroll today. Using a camera to tune into my surroundings really helped me to notice the environment – and I just had to stop and admire this flower. The bud in its move towards the light, had managed to push its way through the fence and bloom boldly on the other side. It reminded me of practising mindfulness – when we focus on our breathing, our body, sounds or being in nature, all sorts of discoveries can appear in the light of our awareness. I sometimes use the image of shining the beam of a torch on myself to see what I can learn about my thoughts, feelings and body sensations in that moment. Looking at this flower brought home to me that I practice mindfulness as a way of moving towards my own light. I took myself for a walk this weekend, up into the Derbyshire hills. As I was climbing a fellside, some low cloud started to roll across the tops, like smoke. It started to snow, so I paused in a copse of young birch trees. Standing right below the snow cloud, I became aware of wanting to make the most of the next few moments – before the snow melted. I enjoyed the feel of the snow as it landed on my skin, the look of it as it lay on the branches and tufts of grass, and the sound of it – I even heard it making a whispering noise as it fell onto dry bracken. I picked some up and watched it melt, change shape, and turn into water… and I noticed my disappointment as it did this. I think part of the reason that snow holds a magical quality for me, is its transient nature – its impermanence. In mindfulness, the idea of impermanence is about accepting that nothing, including us, is fixed and that change is a part of life. A bit like the way each moment is transitory and like snow, melts and gives way to the next one. I guess living more mindfully is about noticing moments before they melt into the river of our everyday lives. As 2014 draws to a close, I thought I’d share an image of a great teacher – Bob, who demonstrates mindfulness by truly immersing himself in each moment. Thanks for following and see you in 2015! I live in an urban environment and you might think there’s not much to photograph in a built-up area, but sometimes as a way of having a break from work I take my camera out on a mindful stroll. So, I was walking around the block one lunchtime, when I decided to stop and really look at some apparently nondescript greenery I’d just passed. As I became more still and took a few moments to get in touch with my senses, I began to tune into the detail around me. I was taken with the water droplets on the leaves, particularly this one which looked like a snow-globe, especially close up – a rain-globe! How lovely to find something so tiny and perfect in its own way just sitting there, waiting to be seen. I spotted this honeybee on a mindful photography course recently and I noticed how grateful I felt as I watched it gathering pollen. The bee was so busy that it was hard to photograph clearly, and although the body looked blurry, it felt amazing to be able to see the bee’s eyes so distinctly as it focussed intently on the flower. It was a treat to be able to stop and pay attention to what’s around me, and to see something that’s really ‘everyday’ – but really special. Feeling a bit bored and having decided that there was nothing worth photographing, I was about to put my camera away – but before I gave up, I decided to do some mindful breathing. When I opened my eyes I let my attention be drawn to where the light was coming into the room. 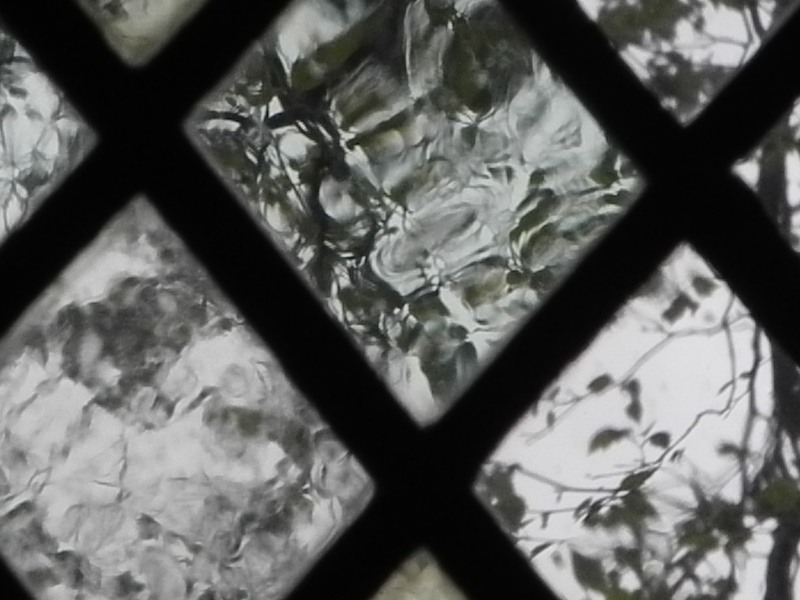 Looking up, I noticed this window with the criss-cross of thick lead and the different textures of glass and leaves of trees, a little distorted behind them. I hadn’t noticed the image before I took a few moments to be still and turn my attention towards my breathing. The focus on my breath seemed to make it easier for me to really see my surroundings. Maybe looking inside helps us to look outside too. I found this dandelion clock when I took my camera on a mindful stroll around the streets where I live. It reminded me part of the process of practicing mindfulness. When I teach mindfulness courses people often struggle (as I did when I was learning) with the time it can take to feel the benefit of mindfulness practice. I often explain that we’re sowing seeds each time we meditate and although we may not feel an instant benefit – in time the seeds will grow if we nurture them. As a person-centred therapist I’ve studied the work of Carl Rogers, who spoke about personal growth given the right conditions. Carl believed that people could heal themselves if the therapist offered the “core conditions” of empathy, congruence, and unconditional positive regard. He said that like plants that need water, soil and sunlight to grow – people will also grow if they have the right conditions. I like the idea that like plants, we can keep growing – reaching towards the light even if the journey there is sometimes painful and difficult. This got me to wondering how we can nurture the seeds we sow when we practice mindfulness. I think having a spirit of kindness and compassion really helps. There may be times we can’t see any benefit from mindfulness, times we can’t be bothered and times we may feel like just giving it up. If we can be kind and patient with ourselves when we meet frustrations then maybe we can let the seeds float freely in their parachutes. Not knowing where they will land but trusting they will grow and that some will have already taken root.